Luke Davis, Tom Phelan, captain Russell Southwick and Yassar Altaf are all smiles. Picture: Redditch Entaco CC. 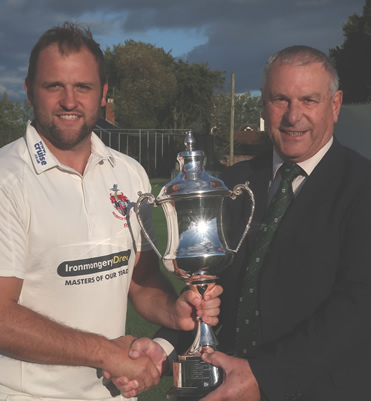 Redditch Entaco skipper Russell Southwick receives the Division One trophy from Worcestershire League chairman Peter Radburn. CAPTAIN Russell Southwick revealed his pride at steering his hometown club Redditch Entaco into the Birmingham League. 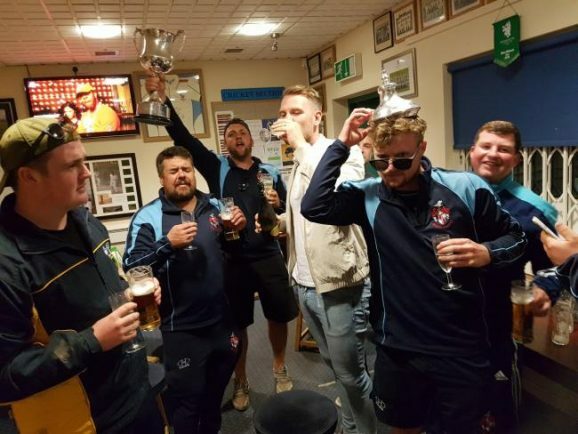 The Kingfishers’ crushing 112-run victory at Herefordshire side Burghill, Tillington and Weobley on Saturday clinched top spot in Worcestershire League Division One for the first time in 17 years and sparked scenes of jubilation among the Redditch players as they look forward to life in Birmingham League Division Three in 2018. The table-toppers have a commanding 43-point lead over second placed Cookley heading into Saturday’s (noon) season finale at home to Colwall and Southwick and Co are determined to finish the campaign in style. “I’m so proud of the lads. They have been class this year and we have exceeded expectations to be fair,” Southwick told the Standard. “I knew from our pre-season fixtures that we had put together a good side and I expected us to be competitive, but I couldn’t have expected us to win the league by such a margin with a game to spare. “We’re a mainly young side with a few older heads and this season we’ve put it all together with some consistently strong performances. I think when the season switched to the win/lose format in the middle section was when we really kicked on and picked up a momentum nobody else could match. 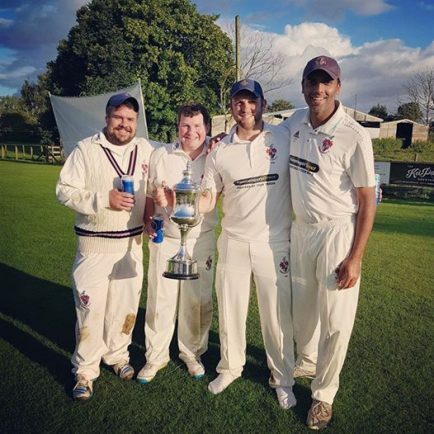 It is a second successive title triumph and promotion for the Kingfishers after the disappointing 2015 relegation to Worcestershire League Division Two and Southwick believes investment in youth has paid dividends. “Most definitely,” said Southwick, 29. “We’ve got lots of young talent at the club and to see the likes of Olly Mason getting us off to great starts at the top of the order and Ghulam Moyhuddin being too hot to handle with the ball has been brilliant. “These are players who have come through the ranks and the young lads play with a freedom and lack of fear which inspires their team-mates. “It’s been a great team to captain this year because I’ve had five front-line bowlers at my disposal. Sometimes I’ve had Greg Chinn as the fifth bowler, which really shows the strength in depth we have. Looking ahead to next season, Southwick said: “We want to finish the job on Saturday because getting to 15 wins would be a great achievement. We will celebrate again I’m sure and then think about the Birmingham League. “Ideally we’ll be looking to keep more or less the same side, with one or two additions to strengthen us. We’ll have to see what happens with Brandon (Weal) because he’s only 19 and has got his university commitments to think of. “If we could persuade him to come back it would be brilliant but, if not, we’ll look elsewhere. We know it’ll be another level of cricket but there’s no reason we can’t have a decent campaign. “I’ve really enjoyed the captaincy. I think it’s helped my batting because as the skipper it does really focus your concentration. Redditch Entaco CC would like to thank all their sponsors and supporters this season, in particular Ironmongery Direct and cruise.co.uk. ON SATURDAY the Kingfishers made 208-9 in an innings reduced to 40 overs despite being inserted on an extremely green wicket. Weal led the way with 45 and Mason continued his good form with 31 before a further rain delay saw the home side set a revised target of 136 off 28 overs. Burghill chased the game but once they lost a couple of wickets Redditch sensed victory and the home side crumbled to 96 all out off just 19 overs. Waqas Ali took his 2017 wicket haul to 52 with 5-31 and the returning Chinn took 3-27. THE 2NDS were frustrated as rain ruined their home clash against Coombs Wood, with just 11.3 overs possible in which Redditch slipped to 35-3. The Kingfishers still have an outside chance of winning Division One 2nd XI but local rivals Feckenham top the table and lead third placed Redditch by 13 points. Stourport are second, eight points above Redditch. Asif Mukhtar’s men finish the season at Colwall, whilst Feckenham travel to Hagley and Stourport visit Coombs Wood.